It hasn’t been an easy road for Miami developers of late, with sales—and construction—slowdowns happening across the market. But experts say the tides are changing. “Miami in general has woken up because the election is over, like the outcome or not,” said Dora Puig, principal broker and owner of Luxe Living Realty, and director of sales and marketing for the new Palazzo Del Sol condo tower on Fisher Island. Before the election, “there was a giant wait-and-see attitude,” she said. “Everything up to $5 million is moving really quickly,” Ms. Sherrill said. As far as neighborhoods that are seeing strong interest, Ms. Sherill pointed to South Beach. Also, there are new luxury developments in Miami Beach and Coconut Grove as well. But generally things are looking up in 2017, said Mr. Daniels. “The end of 2017 and the beginning of 2018 will be a very interesting time in Miami real estate,” he said. 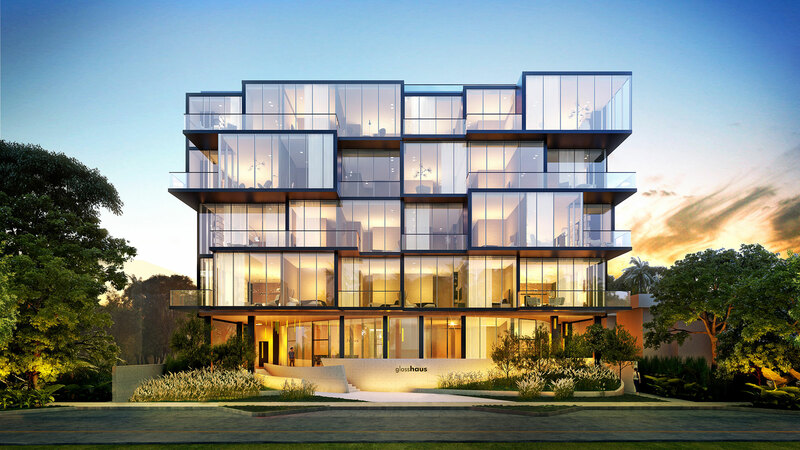 This elegant new glass structure soon rising in Coconut Grove is aimed at local empty nesters. Aptly named GlassHaus, the five-story contemporary structure will feature floor to ceiling glass, open floor plans, stone flooring and top-of-the-line appliances. These are large, livable residences targeted to local affluent couples moving out of their big houses who don’t want to compromise on style and would never leave the Grove. The 23 units will include three on the ground floor, off of a Zen garden, then four more floors of five units each. The apartments will have Italkraft kitchens with Bosch appliances and Duravit bathroom features. The building will stand on a 22,000 square-foot lot on 27th Avenue, two blocks from Biscayne Bay and three blocks from the heart of the village of Coconut Grove. The owners get membership in the waterfront Coconut Grove Sailing Club three blocks away. Owners also have use of the building’s fleet of electric bikes. Sales will launch this spring, with construction expected to start in the late fall and completion by fall 2018.